The sole intention of our organization is to provide the youth of our area an avenue to participate in competitive sports. We will use this "tool" of sports to integrate, initiate and ingrain valuable life skills, both physically and mentally, that will benefit them well past their sports lives. Were glad you stopped by. Be sure and visit all of our WebPages! Boys ages 6/7U, 8/9U, and 10/11U will be played on Saturdays starting at 9AM EST. Game times will be set based on registration numbers. 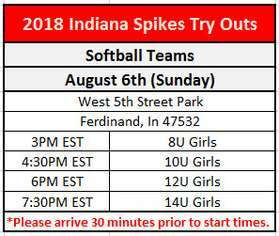 Girls ages 8U, 10U, and 12U will be played on Sundays starting at 1:00PM EST. Game times will be set based on registration numbers. The intention of our intructional fall league is to give players an opportunity to learn "next years" game. For instance: 8U boys will have a chance to see live pitching for the first time and learn how to steal a base. We do not keep score or have league champions. We believe a less competitive environment is more condusive to learning, which will help coaches achieve our goal of teaching. Click on the "handouts/info" button to download the registration form. These are instructions to help you find any Spike team's webpage, whether the current season or past seasons. Look at the menu on the left hand side of this page and click on "Find a Spikes Team". Then, on the next page that comes up, select the year (any past season's year) of the team you are looking for on the right side of the screen. [Note: Individual Team Sites were discontinued after the 2008 Season.] Then find the age division of that year on the left and click on it. That will arrive you at that team's individual webpage. Do you have news, photos or info to add to the Spikes website? Please take a moment to let us know you spent some of your valuable time with us at our site. We look forward to hearing from you about your visit. Certian pages of the Spikes website are password protected, this is, you must be approved before being allowed to visit those webpages. 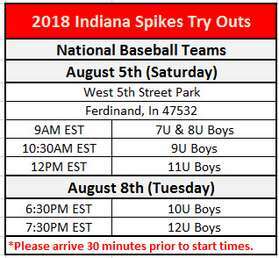 Access to those pages is exclusively for Spikes players, coaches, parents or guardians. If you are one of the aforementioned people, just follow the directions after clicking on any secured page. If you don't have an e-teamz account, you must first set one up. Just follow the step by step directions. The Webmaster will be notified of your request and will respond in a timely manner. is the other half of education. Its better to be a good American than an all-American. Are you ever going to swing?